KVM trays and drawers for remote access and monitoring within the server cabinet. 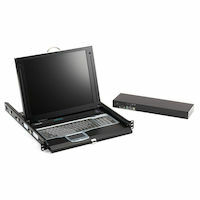 Reduce clutter and save space in the server room with rackmountable KVM console trays and drawers. Use these integrated, 1U console drawers to manage servers in data centers, server rooms and other space critical environments directly from the racks where they are installed. You can install a keyboard, monitor, and mouse all in your 19" rack. When it's time to work, just slide out the drawer and open the flat-screen monitor. When you're done, just slide it back into the rack. Call for a free consultation on your specific application. 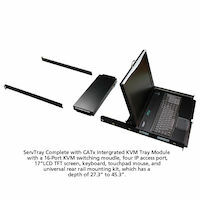 Talk to one of our application engineers at 877-877-2269. .
Access via a local KVM Tray, or from a remote user station up to 1000 feet away. Access your KVM tray remotely to manage your servers over the Internet. 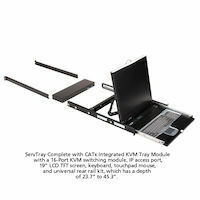 Install a rackmounted keyboard, monitor, and mouse together with a KVM switch module in 1U. Install a rackmounted keyboard, monitor, and mouse together with a KVM access module and an IP port for even easier access. Install a rackmounted keyboard, monitor, and mouse together with a KVM switch module and an IP port for even easier access. 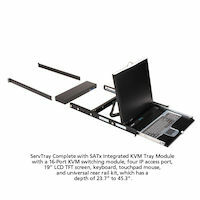 Access your KVM tray remotely to manage your servers over the Internet..